The Downs Group are pleased to be the sponsors of The Downs Group Tough Kids Competition. The competition is an exciting off road obstacle course for year 3-8 kids in the Rangitikei Region. The event takes kids to the beautiful McIntyre Reserve in Ohingati where they have a fantastic day of fun and mud, yes there is always plenty of mud! The November event attracts school kids from all over the region. Roughly 500 kids join in the fun hoping to be named Tough Kid of the year. Obstacles very from year to year but we always have the monster water slide and yucky mud run! It is great to be able to support this event, especially the schools in our local regions. For the past 10 years the Country & Western Festival has been an outstanding success for the town. hundreds of Camper vans, thousands of people and some of the finest country and western stars available attend the weekend event. In fact it grows more and more ever year! The Downs Group is pleased to be associated with this event. The Downs Group are proud major sponsors of the Marton Golf Club Christmas Tournament. 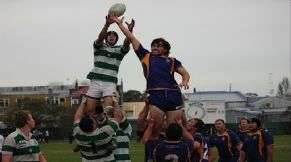 The Marton Rugby Club is based in the heart of the Rangitikei District. They have a Premier and Senior men's team playing in the WRFU Competiton for 2015 season. They pride themselves on fostering a brotherhood team environment on and off the field and providing a family and friendly clubrooms for our local community. The Downs Group is happy to be one of the club's business sponsors.